"41AN2-53, Unknown" by Timothy K. Perttula and Robert Z. Selden Jr.
DECORATION: There are three engraved ovals in a panel on the rim. Each oval is defined by three closely-spaced curvilinear engraved lines on either side of the oval. The remainder of the panels include another set of three closely-spaced curvilinear engraved lines and two cross-hatched hour glass-shaped dividers. The body of the vessel has horizontal and overlapping brushing marks. Poynor Engraved, var. 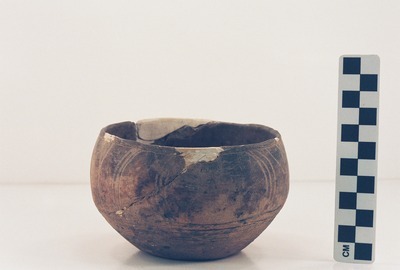 Cook carinated bowl (Vessel 41AN2-53).